Tony Stewart is a busy man this year. Last Saturday night at Richmond International Speedway, Tony Stewart took his #20 Home Depot Pontiac to victory lane for his tenth Winston Cup win in 79 starts. He beat Jeff Gordon to the finish line and at the same time, earned his tenth WC victory in seventeen less races than Gordon did. This was Tony's first win of the 2001 season and an important accomplishment, giving boost to Tony's expectations for this year. Tony's first career Winston Cup victory came at this very same track in 1999 when he led for over three hundred laps. "This is probably the most competitive Richmond race I've ever been a part of", said Stewart of his fifth start there. Asked what he attributes his success on this track to, Tony replied "Dale Earnhardt taught me a lot about this place. I followed him a lot of laps and he'd just flat wear you out. You'd think you were gonna beat him and pass him and he'd just come right back up on you. So you learn how to save your tires and not abuse your equipment around here. So I learned a lot from him." 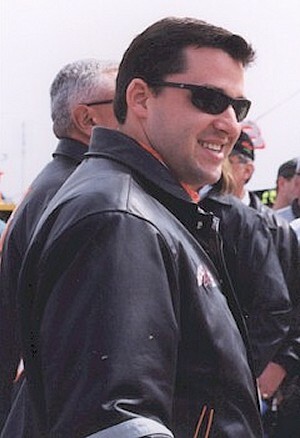 As a result of his Richmond win, Stewart jumped two spots in the standings to seventh place, just 172 points behind leader Dale Jarrett. "I think this definitely put us back in the championship picture," said Stewart. "We're working awfully hard. These guys never give up and I've never given up and we're not going to give up now." Having been the leader in wins last year with six, one more than champion Bobby Labonte, it seems Tony has his eye on that championship prize. Tony is not content though just to be working toward that Winston Cup Championship. There is one more prize Tony desires to have and that is a win at Indianapolis. Not in a stock car mind you, but back in an open-wheel car. Tony has been given clearance by Joe Gibbs Racing and Home Depot to team with CART driver Jimmy Vasser and drive a G-Force/Aurora Indy Racing League car. He will be part of the two-car Target Chip Ganassi Racing team in the May 27th running of the Indy 500. Joe Gibbs has given Tony Stewart clearance to run in the Indy 500. 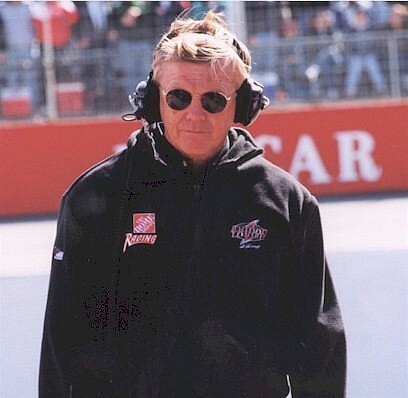 Joe Gibbs agreed to help Stewart achieve his dream of winning the Indy 500 and a deal was struck. However, said Gibbs, "Tony's number one responsibility will be the #20 car and the Coca Cola 600." Tony has pledged to donate $100 to charity for every lap he completes in the Indy race. Home Depot and Target Chip Ganassi racing have pledged to match Tony's contributions as well. The proceeds are going to the Victory Junction Gang Camp, an extension of the original "hole in the wall gang" camp founded by Paul Newman. The camp is to be built by Kyle Petty and wife Pattie as a tribute to Adam Petty. Kyle's son was killed last year in practice at New Hampshire speedway. Tony has been accused of brash behavior at times both on and off track but no one questions his work ethic and desire to win. Besides, I seem to recall another driver accused of brash behavior on the track - but that's another story and something tells me this one is just getting started.